Picture yourself on a road bike adventure through the breath-taking and rolling countryside. You’ve just enjoyed the pleasure of a long descent, and ahead of you is a great big hill. You approach the gradient change, and start madly fiddling with your gears until you hear the dreaded clunk of your chain dropping off the chain ring, causing you to stop. Not ideal. In order to avoid this and to nail the uphill gear change, we have compiled some advice on gear change and a few other road bike climbing tips. First, let's get our terms straight so we're on the same page. You can think of gears as the same thing as speeds -- a bike with 18 gears is an 18-speed bike. Bikes generally have 1, 3, 18, 21, 24, or 27 speeds. Lower numbers are the low gears, and higher numbers are the high gears. First gear is a low gear. Twenty-first gear is a high gear. That's pretty easy, right? Shifting means going from one gear to another. You shift gears by sliding the shifter on the handlebars. On most bikes this shifts the chain onto a different sized ring. On three-speed bikes the gears are inside the hub of the wheel so you don't see them. Downshifting means going to a lower gear, and up-shifting means going to a higher gear. You can also say shift down and shift up. The actual shifting of gears, clicking from one to another is not difficult. The key to shifting is anticipation. It's just a matter of getting the feel for going up or down in the range of gears, and the good news is that being able to shift smoothly is about 80% practice and only about 20% understanding what's happening. In no time at all, you'll be shifting like a pro, changing gears smoothly without even thinking about it.. This is the same as you would in a car. A car will stall taking off in 4th and a bike will crackle and groan if you push too hard a gear from stationary. This is really important on a road bike which typically runs much higher gears than a recreational family bike. There is no worse sound than that of a chain grinding and snapping through cogs. Good cycling technique involves learning to caress the chain between cogs and this means always pedaling when flicking the gear lever. Similar to above, not only should you always be pedaling, it is also wise to ease up on the pedals (while still turning them of course) until the chain has completed its movement through the cogs. Shifting while pushing hard on a big gear is an advanced skill and comes with a lot of practice and familiarity with your bike and the gears themselves. By assessing the climb way in advance you can prepare yourself and attack it with optimum results. Check whether the gradient is consistent or if it changes. Are there any obstacles, cars, and what kind of road surface it is? This is important as we don’t want to lose our momentum. Try and maintain a fast cadence going into the ascent, (between 90-100 RPM) and if you do need to change gear don’t leave it too late as changing under chain pressure can drop the chain. A common mistake is to ride in the lowest resistance gears (largest sprockets) on the rear cassette, and stay in the big ring too long as it feels comfortable. Eventually you will have to change into the small ring, losing all momentum in the change, so it is better to change off the big ring early. When changing to the small ring, try to work into at least the middle of the rear cassette as quickly as possible. This avoids chain cross extremes – which are inefficient and can increase the likelihood of dropping the chain. 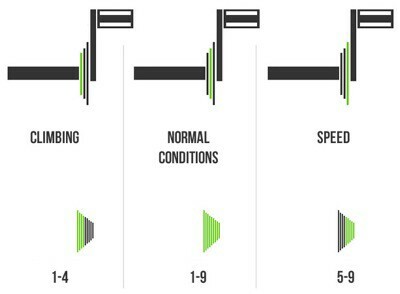 Once on the climb, pedaling smoothly in the saddle works really well up to 10% gradient, for 10% upwards, think about changing from seated to standing to rest muscle groups. When climbing, avoid looking down at your pedals, always look ahead and keep the chest open. This is relevant in gear selection as by looking ahead you are anticipating changes and adjusting gears accordingly well in advance. Climbing is loved by some and hated by others. Learn to love it!